agriculture initiatives. Results will be improved access to water and sanitation, reduction of rural poverty, improvement of food security and creation of employment. Innovative approaches. Experiences with innovative approaches to reach the SDG6 and water related SDGs (Poverty, Food, Health, Employment). Examples of approaches are: FBM (Family Based Management), The Jacana business model, (supported) Self-supply, Well clubs, Faith & Water and approaches regarding HWTS; the Ethiopian Utility method and SWAM ( Safe Water for All in Malawi). Innovative technologies. Over 20 new and/or improved low-cost and locally produced water and sanitation technologies. How to produce, maintain and market them. Building Supply chains. Experiences in training artisans, masons ,drillers, welders and longer term coaching of local SMEs. What does it take to train and guide promising entrepreneurs and to help them grow financially sustainable. SMART Centres. What does it take to establish and run an income generating knowledge/ Training Centre like a SMART Centre and how to get knowledge into national vocational training. 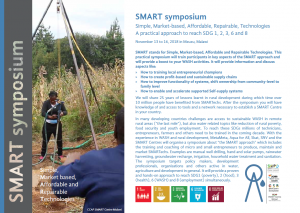 This Symposium can raise interest in more in-depth advanced course on establishing supply-chains and training in specific SMARTechs like manual well drilling, hand and solar pumps, rainwater harvesting, HWTS etc..